XI’AN, China, April 11, 2018 /PRNewswire/ — Recently, PV Tech released an article about leading integrated high-efficiency monocrystalline module manufacturer and ‘Silicon Module Super League’ (SMSL) member LONGi Green Energy Technology. 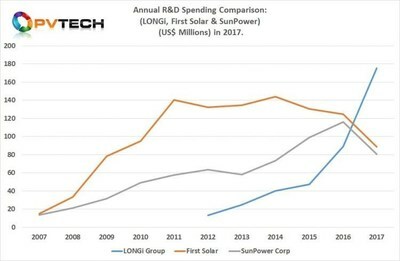 LONGi set a new solar industry R&D expenditure record in 2017, not only surpassing the two historical leaders, First Solar and SunPower, but also spending more in one year than any PV manufacturer to date. According to LONGi’s recently released 2017 annual financial report, total R&D expenditure in 2017 almost doubled to RMB 1.1 billion (US$175.7 million), up 96.67% from US$89.2 million in 2016. LONGi reported total revenue of RMB 16.362 billion (US$2.59 billion) in 2017, up almost 42% from the previous year. Therefore, R&D spending accounted for 6.77% of revenue in 2017. According to PV Tech’s long-standing analysis of R&D spending of leading PV module manufacturers, only SunPower has come close to LONGi’s level when, in 2015, R&D spending accounted for 6% of revenue and First Solar topped 5.1% in 2011. However, one of the key metrics is that LONGi surpassed perennial top ranked R&D spenders, First Solar and SunPower, respectively, by a significant margin. Both companies cut R&D spending in 2017, the first time for SunPower in four years, while First Solar trimmed R&D spending for the third consecutive year. In contrast, LONGi has increased R&D spending for six years in a row and has maintained a high-level of R&D investment over the last four years. Initially, LONGi was a dedicated monocrystalline ingot and wafer producer, but in 2015, the company started producing monocrystalline solar cells and modules. Focused on high-efficiency PERC (Passivated Emitter Rear Cell) technology, R&D spending almost doubled each year after 2016. However, in reporting R&D expenditure of US$175.7 million, LONGi also set a new annual solar industry spending record, according to PV Tech’s analysis. First Solar had previously held the record at US$143.9 million, set in 2014. First Solar remains the leader in R&D spending on a cumulative basis, reaching over US$1.11 billion between 2007 and 2017. SunPower remains second ranked at over US$663 million in the same time period. However, LONGi has jumped ahead of several other PV manufacturers to take the third ranked position with over US$390 million in cumulative R&D spending since 2012.